Dimensions: 8-1/4 x 5-3/4 in. 88 pages. Color photographs throughout. Paperback. What's the hottest new trend in cookie decorating? Painted cookies with colorful, edible icings! These oh-so-stylish sweet treats are perfect for holidays and parties throughout the year. 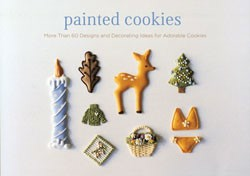 From simple lettering ideas to elaborately adorned wedding cookies, now anyone can learn the techniques of the pros, including cutting custom cookie shapes, piping flowers, creating faux knitted looks and other patterns, and more. With step-by-step instructions, decorating templates, and dozens of photos,Painted Cookies makes it easy to create original masterpieces worthy of the most elegant event.